One of my main goals of this blog is to keep myself accountable for my investing decisions because I am a loose believer in the Efficient Market Theory and think most people should invest in low-cost index funds. All of my retirement accounts and a good chunk of my taxable account are invested in low-cost Vanguard funds (I'm sort of a Boglehead in that sense), but I do believe there are some opportunities for the smallish investor to exploit the market if you have the right temperament and the time/energy to devote to the process. 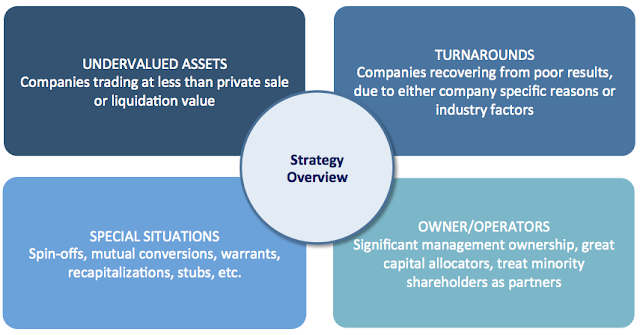 Below is a quick visual of the broad investment themes where I concentrate my time and believe where investors can generate above market returns, the more themes an particular investment hits the better. I work in the banking/financial services industry, so my background knowledge and circle of competence skews towards investments in asset based businesses. My goal over the long term (10+ years, multiple market cycles) is to generate an IRR of 20%, which will be difficult, but if I'm going to spend the time and effort, I want to make sure its worth my while over an index fund, otherwise I could be using this time on other income generating activities. I started my active taxable account at the beginning of 2011 (but have been investing since 2004), below are my result from my first three years, a time period where I've admittedly had the wind at my back with only a few short and shallow corrections. A couple clarifying points, my returns are an annual IRR for each particular year which produces slightly different results based on when I added cash to the portfolio (I haven't made any withdrawals), the 2013 returns are "pure" as I didn't make any additions to the account during the year. The S&P 500 returns are not based on IRR, so its not quite an apples to apples comparison, and additionally one could argue the S&P 500 is not a proper benchmark given my lean towards small cap value stocks. At this point, I'm pleased with my overall results, but also realize that I could be just lucky given the short time frame. I also thought it might be beneficial to post my portfolio on a quarterly basis, so readers can relate and Monday Morning Quarterback my decisions, plus it will force me to only invest in high conviction ideas. The below is my taxable brokerage account which follows the ideas that I post on this blog, as a full disclosure it's only a smallish portion of my net worth so the appearance of concentration or margin debt is not particularly significant for me, at this point its more of a hobby account. As I learn and gain experience, I will probably gradually transition some of my retirement accounts and other taxable accounts to a similar strategy, and at that point I'd probably also diversify further to 20-30 positions. So take the above performance figures and holdings with a little grain of salt. This question is for Gary. So it looks like the personal injury business is growing nicely, and I'm sure there's good potential in the disability benefits business. But with your stock around $8.50 and a book value in excess of $13, and that's excluding the value of the zero basis portfolio, it's kind of hard to imagine how anything could have a better return on invested capital than buying back your stock. I mean, said differently, the market appears to be valuing all of your noncash assets at about $17 million. So I was hoping you could shed some light on how you think about the trade-off between maintaining the high cash balance for potential investments, especially in this challenging pricing environment, versus buying back your stock. CEO Gary Stern then punts the question (which he has in the previous couple of conference calls as well) by talking about the private market transaction they did with an activist shareholder (PMCM) in June 2012 - they've also allowed their share repurchase program to expire last March. First, management purchased shares back from PMCM at $9.40 a share, a premium to the then market price. Why didn't management do a tender offer so that all shareholders could have benefited? Probably because they wanted to reduce the activist stake and reduce the pressure on themselves. Second, Robby Tennenbaum is exactly right, there's almost no investment that Asta could make that would be more accretive to shareholders than to buyback shares. I just have a hard time selling at these prices, and when I invest in a deep value stock like this, I go in with an intended holding period of 3 years which should give management or the market enough time to realize a firm's intrinsic value. One of my larger positions has been in AIG, and it has contributed significantly to my portfolio's success this year. I believe that large financials in the US are one of the few places to find significant value. AIG still trades at a meaningful discount to book value, despite it's great turnaround in both operational metrics and capital allocation. The company remains overcapitalized and will have significant opportunities to return cash to shareholders, hopefully in the form of share repurchases if its market price remains below book value. Increasing interest rates should also benefit AIG as their low yield fixed income holdings roll over generating a higher ROE and EPS. Early in 2014, I plan augmented my position (with fresh cash) in the AIG common stock with the TARP warrants that were issued in 2011 with a strike price of $45 and a maturity date of 1/19/2021. I probably should have bought the warrants initially, but despite the run up in 2013, they still represent a great risk/reward profile and one of the few opportunities to earn a high IRR for 7+ years (also potentially valuable tax deferral). The warrants come with a few anti-dilution adjustments to protect holders from dividend payments (above $0.16875 per quarter, the current dividend is $0.10 per quarter), stock dividends, rights offerings, and above market tender offers. With the ILFC sale approaching a resolution, AIG remains one of my highest conviction holdings and should be setup for another good year in 2014. 2013 was a great year for the markets, I'm pleased to have out-performed over the broad market, and eked out a small gain over many diversified mid/small cap value funds. Thank you for reading during the past 12 months and Happy New Year. I'm here in Honolulu on vacation, so I took the short walk over to Ward Village to get a first hand account of one of Howard Hughes Corporation's primer strategic development assets. Howard Hughes is planning to turn Ward Village into a vertical master planned community with 22 residential towers (4,000 units) and 1.5 million square feet of prime retail space. Back in March, I put about a $2 billion value on the redevelopment asset (discounting it back to today), but given its long time horizon that's a very rough number that's subject to a lot of change. What follows are just some random thoughts and pictures I took as I walked around the property today. Below is the map of Ward Village, just south of the map is the Pacific Ocean, I can attest that any condo towers that are built in the area will have fantastic views of the ocean to the south, and great city views to the north. For me, seeing the current state of Ward Village was a mixed bag, its a great location, but its current form is rather scattered and somewhat disappointing. With it being 4 days until Christmas, I'm happy to report that all the parking lots were completely full with cars circling for spaces, but most of the current Ward Village is Class C quality at best. The below sign pretty much wraps up the current state of Ward Center and most of the entire property, quaint, but sort of stuck in time and clearly targeted at the lower-middle class shopper. Ward Center feels like a small town indoor mall, not something you'd expect to see in downtown Honolulu. The stores are mostly small local operations, one of the anchor tenants is Famous Footwear, and the hallways are tiny. Again, it was fairly crowded, but likely due to the holiday season, I don't see why someone would go to Ward Center over Ala Moana mall just across the street. Ward Warehouse is pretty similar to Ward Center, but its an outdoor mall, but the same small town feel with local retail stores, but not really targeting the tourist market. 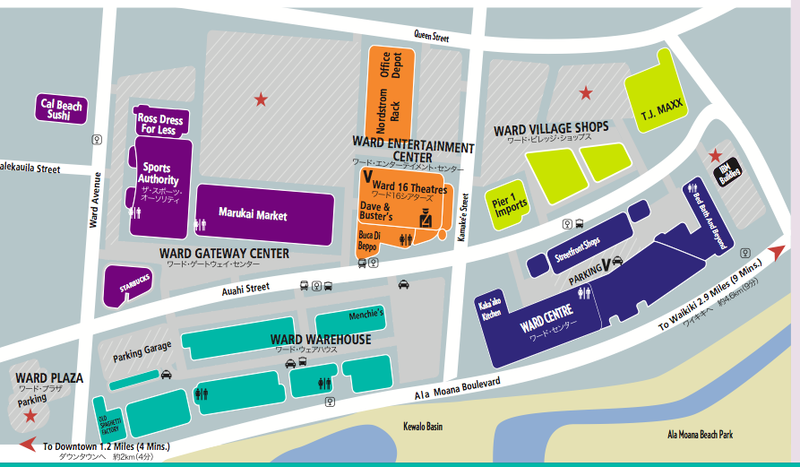 It seems odd to have both Ward Center and Ward Warehouse next to each other, they're different, but the same, definitely an opportunity to redevelop the area. Neither are particularly valuable in their current form. Across the street from Ward Warehouse is a pretty typical strip mall, nothing particularly interesting about it, looks dated, but still useful too. I'd imagine this area is towards the back end of the redevelopment project, but there's a lot of unused space, it looks more like a strip mall in a suburb than something you'd expect to see in an urban center. The IBM Building, which is going to double as the sales office for Ward Village is the only sign of construction I see currently (and on a Saturday). Slightly disappointed that it didn't appear the sales office was open yet as I was hoping to get a few brochures or more information. On the plus side, The Ward Village Shops are nice and brand new with Nordstrom Rack and TJ Maxx as anchor tenants that distinguish the area from the Ala Moana mall next door. The Ward Entertainment Center with the movie theater looks in reasonable shape as well, and will probably serve as a nice central point of the new planned community with only minor renovations needed. Overall, I guess I didn't find anything groundbreaking walking around the property for an hour or two, but I did get a sense that the transformation isn't going to happen overnight, this is a long term asset that's going to take many years to fully play out. 22 towers will take a long time to build and sell without overwhelming the market, patience will be key. I was fairly lucky and purchased Howard Hughes in the mid $30s when it dived in October 2011 (the last real market correction we had), so I'm sitting on a lot of gains. Howard Hughes has a lot of great themes at play, its really a company that probably shouldn't be public, management doesn't issue guidance and the quarterly earnings results mean very little. Also there's an owner/operator theme at work, David Weinreb bought in significantly when he took the CEO job, and Bill Ackman is the Chairman of the Board and has stated very publicly that he may never sell Howard Hughes and calls it one of the undiscovered gems. While its hard to say that Howard Hughes Corporation is currently materially undervalued, I'm reasonably confident that the capital allocation decisions will be made with shareholder interests in mind, always important, but particularly so for a real estate development company with a long runway and many projects to choose between. I'm planning on holding for the long term, let my gain hopefully compound, and defer the tax man.